Perform the maf meter inspection according to the procedures below. Only replace the maf meter when both the long ft#1 value and maf value in the data list (with the engine stopped) are not within the normal operating range. Clear the dtcs (see page es-35). Start the engine and warm it up with all accessory switches off until the engine coolant temperature is 75°c (167°f) or more. Drive the vehicle at 50 km/h (31 mph) or more for 3 to 5 minutes*1. Allow the engine to idle for 2 minutes*2. 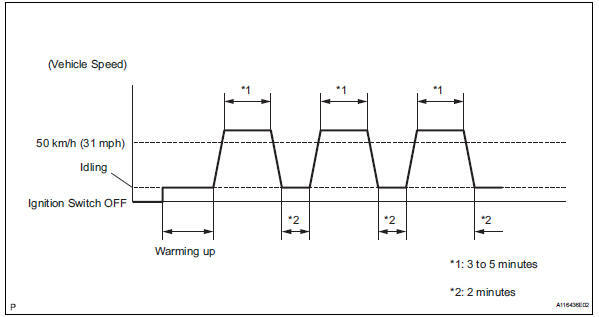 Perform steps *1 and *2 at least 3 times. Read the value using the intelligent tester (long ft#1). 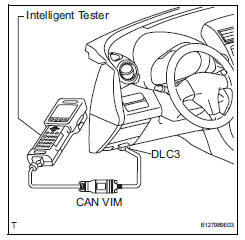 Select the following menu items: diagnosis / enhanced obd ii / data list / primary / long ft#1. Read the values displayed on the tester. If the result is not within the specified range, perform the inspection below. Read the value using the intelligent tester (maf). Perform the inspection with the vehicle indoors and on a level surface. Perform the inspection of the maf meter while it is installed to the air cleaner case (installed to the vehicle). During the test, do not use the exhaust air duct to perform suction on the exhaust pipe. Turn the ignition switch to acc. Turn the ignition switch on (do not run the engine). Select the following menu items: diagnosis / enhanced obd ii / data list / primary / maf. Wait 30 seconds, and read the values on the intelligent tester. Standard condition: less than 0.45 G/sec. If the result is not as specified, replace the maf meter. If the result is within the specified range, inspect the cause of the extremely rich or lean air-fuel ratio (see page es-147).